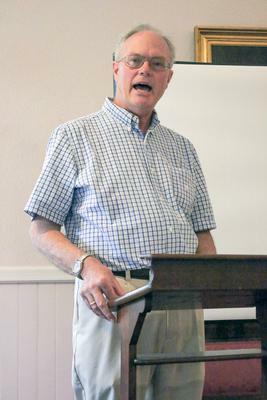 Douglas Rooks, author and former political reporter, columnist and editor for the Kennebec Journal and Maine Times, outlined the rise of the Democratic Party in Maine as a visiting author at Witherle Memorial Library on July 16. His recent book is titled Rise, Decline and Renewal: The Democratic Party in Maine, and he penned a biography of former Maine Senator George Mitchell as his first publication. Rooks began his talk with Governor Edmund Muskie, ended with some advice to the Democratic Party, and in between provided a historical snapshot of Maine politics of the last 100 years. Muskie ran for governor in 1954, and his unexpected election signaled the start of an upswing of the Maine Democratic Party after nearly 100 years of Republican dominance. He then went on to serve in the U.S. Senate for 31 years and as Secretary of State under President Jimmy Carter. Muskie also “reduced a group of elderly women to tears” at a Castine campaign stop by talking about the young men who had to leave Castine to find work, Rooks said. Rooks poses the question why, 30 years after Muskie put the Democrats on course to be dominant in Maine, the party has declined in elected candidates and party strength. Rooks described two-term governor Kenneth Curtis (1967-75), a graduate of Maine Maritime Academy who was later tapped to lead the school, as the kind of Democrat who strengthened the party and made things happened. Curtis championed and helped get the Maine progressive income tax passed by the legislature despite initial public and political sentiment against it. Curtis saw the tax “as the only alternative for raising money for the future,” Rooks said, and needed to fund education, conservation, unemployment compensation and social programs, and to keep the University of Maine system competitive with the rest of the nation’s public universities. At the time, the legislature was inclined to raise the sales tax to bring in more public money. The emergency progressive income tax measure narrowly passed a two-thirds vote in the House and Senate. A subsequent referendum to repeal the income tax failed by a measure of 3:1, showing its gaining popularity. While Curtis was a politician who ran on practical issues and kept his campaign promises, currently the Democrat Party has trouble “mustering the nucleus of support it needs to elect candidates” and lacks a clear, concise platform, Rooks said. The renewal of the party referenced in his book’s title is future-looking. Rooks also noted that, in his opinion, term limits for representatives have limited the depth of political experience and expertise in the legislature, and that the rise of independent candidates takes advantage of voters’ discontent with the political system but only connects citizens to one politician, not a platform of political beliefs. When asked for a prediction of the November Maine elections, Rooks laughed.